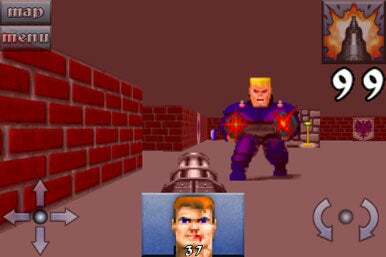 Wolfenstein 3D popularized the first person shooter when id Software released it in 1992. Over the years, the game has been ported to a variety of platforms, and now it has found a home on iPhone and iPod touch under the name Wolfenstein 3D Classic. Achtung, Baby: B.J. Blazkowicz is back and so are his well-armed Nazi adversaries in Wolfenstein 3D Classic. Wolfenstein 3D Classic puts you in the boots of soldier William “B.J.” Blazkowicz; you must fight your way through six different episodes each with eight levels and a secret level. You’re armed with a variety of weapons to battle the Nazi soldiers, undead mutants, and other foes. Each episode culminates with a boss battle. To help you along the way you’ll pick up ammunition for your weapons and first aid kits and food to restore your health. There is also treasure to collect and secrets to uncover. Four difficulty levels provide additional replay value. Gameplay, graphics, music, and sound effects are all faithful to the original versions. Don’t expect next-generation graphics here—this is retro gaming at its finest. Frame rates are high so the action is fast and smooth, and if you tire of the game’s soundtrack, you can elect to roll your own from your music library. Another nice feature is the ability to zoom in and out on the level maps with the pinch gesture—that’s something the PC or console ports never had. All in all, id Software has succeeded in reuniting old fans with a classic and bringing new gamers a terrific first person shooter. (This version costs $2—what id bills as a limited time sale—and a lite version lets you play the first three levels of Episode 1 for free.) This bodes well for future id releases for the iPhone from its fantastic catalog of games. Wolfenstein 3D Classic is compatible with any iPhone or iPod touch running the iPhone 2.x software update.